Need more room for your, uh, "video" collection? 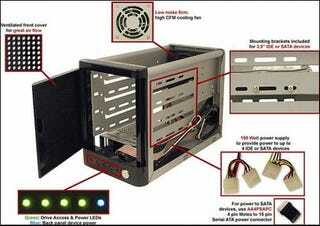 The Addonics Mini Tower lets you hold up to four 3.5-inch SATA or IDE drives all under one casing. Each drive has its own activity indicator and the tower also has a vented front cover and fan to make sure your HDDs don't fry. We particularly like the that the tower has interchangeable back panels, so you can customize how it connects to your computer choosing between eSATA ports, USB, or Infiniband Multilane interfaces. The tower starts at $119 depending on how you have it configured.